I really don't exercise that often. Those of you who know me are probably exclaiming "no way!" right now, wondering how on Earth I keep my round, soft physique so maintained without exercise. I know. It's amazing. Well, I should clarify. I don't do anything that could be considered traditional exercise. I don't go to a gym, workout to a DVD, or go running. I do take the girls on walks, which usually involves either pulling a wagon or pushing a stroller, and I do run after them and I do participate in some mean dance parties. I'd honestly love to join a gym right now. Specifically one with a great childcare program. But I haven't found one that is a) reasonably priced or b) conveniently located. I know, excuses, excuses. Anyway, a few weeks ago when I was signing Madison up for a cooking class through parks and rec (the day registration opened of course, since I'd heard this was a popular one), I flipped through the adult classes to see if anything caught my eye. I took tennis lessons a few years ago, and though I have another place to play tennis now, I seemed to remember they had some other interesting programs. And last year when I took photography, I remember a nice added benefit to learning about my camera was a regular night to do something for me. It was worth checking out what was available. What was available was Zumba. 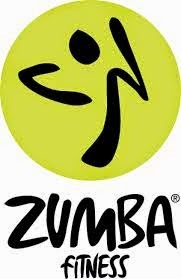 I know the Zumba craze actually started a few years ago, but since I'm not exactly a cutting edge person, I'd never tried it. I heard it was a good workout and also a lot of fun, so it seemed like a winning combination! Get some exercise, have some fun, meet some people, get out of the house by myself...win! Adam was a bit skeptical when I told him I wanted to take the class. First of all, he knows I don't work out. One of the reasons I haven't joined a gym is that he doesn't trust me to stick with it. Foolish, really, since if the gym I join has childcare included I'll definitely use it as much as I can handle. Maybe I won't always work out, but I'll go. And paying in advance is usually a good motivator. If I was paying by the class, I'd come up with excuses. But if I prepaid for ten sessions, I'd feel obligated to see it through. Argument made! OK, now he trusts me to actually go ten times. But he wasn't positive I should write the check yet. Because even more importantly, he was a little worried about the time of the class. Five o'clock on Monday afternoon. I'd have to leave during his workday, cutting it short. Then I'd be home after dinner, so he'd have to get the girls fed. It wasn't a great time and he wasn't sure he could make it work. Then he realized that he was discouraging me to exercise and he changed his tune right away. Not quite sure how I feel about that. I'm sure he just agreed that getting out the house alone was worth it. Last week was my first class. I dashed out of the house at the last possible minute, because Adam was still on a call. I made it just in time, found the room in the rec center and was greeted by an extremely enthusiastic instructor who was wearing a belly dancing scarf and turning on her disco lights. Huh. I knew Zumba was a lot of dancing, but I wasn't anticipating quite as many "Dancing With the Stars" style accessories. She was very cheerful, checked my name off on her list, and told me to set my water bottle against the wall. Right. Because when people work out they generally drink water. Forgot about that. I gave her a blank stare, not quite sure how to admit that water never even crossed my mind. The best I could offer was an unfinished cup of coffee in the cupholder in my car, and that wasn't exactly showing my best side. Eventually I gave her some totally lame and fake sounding excuse about leaving it home, and she pointed out the location of the water fountain and politely (and cheerfully!) suggested that I might want to bring my own bottle next time, just so I wouldn't have to leave the room. I'm pretty sure as she walked to the next arrival she snuck a peek to see if I was wearing sneakers and workout clothes. Which I totally was. Sneakers and yoga pants AND a ponytail. And I'm sure I would have remembered even if I hadn't been wearing sneakers and yoga pants all day long. Anyway, as the class started she encouraged those of us who were new to watch some of the others in class, and reminded us that the most important part was to keep moving and have fun, even if we did get a little lost. Without any further instruction, she cranked the music and off we went. And not to brag, but I totally nailed it. I was following all the steps, getting all the arm movements, and, although I definitely felt like I was exercising, I wasn't winded or overtaxed at all! Score! I was a natural! I knew all that dance based reality show watching was worth it! And then I realized that was the warm up song. And exactly 1/12 of the class. Midway through the second song, I realized that I really should have worn a sports bra. Long story short, I was not quite the natural I thought I was. There were a few moments when I was praying a song would come to an end so I could dash to the water fountain, and there were some core strengthening moves that were really working my core. And there were some moves that my body was just laughing at and I'm pretty sure anyone watching would have been laughing too. And there were several moments where I was suppressing my giggles at the random yells of "zumba!" and "woo!" from the instructor. I'm not really a woo girl. Still, it was fun, it was a definite workout that I felt the next day, and I didn't make a complete fool of myself, so I'm counting it as a win. Tonight is night two....will I improve? Or was last week all a warm up for what's coming next? On the plus side, I wrote WATER in giant letters in my planner underneath every class. And I made sure to put the water in my bag last night. And I've got my yoga pants and sneakers. Yup, I've totally got this. Wait, do I even own a sports bra? Maybe I'll be a Carrie Bradshaw...not in the NYC bachelorette lifestyle, but since I have to get a sports bra, I'll make shopping my cardio! I have to admit, even if I never become a Zumba enthusiast, it's nice to get some alone time. And speaking of alone time, don't forget that I Just Want to Be Alone is available all sorts of places now. The reviews are AWESOME - have you left one yet?